Smooch connects your business software to all the worldâ€™s messaging channels for a more human customer experience. With more than five billion messaging app accounts worldwide and a growing fleet of voice assistants, the way we communicateâ€”with businesses, technology and each otherâ€”has fundamentally changed. Businesses know they need to be wherever customers are and customers are ready to chat with businesses in a more convenient and personal way. But managing conversations across countless disconnected channels and their ever-changing APIs is frustratingly complex. And itâ€™s only getting harder. Your partner in all things messaging, Smooch integrates with your existing business software and enhances it with the power of conversation. We provide the infrastructure and take care of the grunt work so you can focus on building an amazing product and user experience. Enterprise software companies, bot platforms and SaaS startups all rely on Smooch to take their messaging products to the next level. With a single API, Smooch connects your software to any messaging channel, unifying all customer interactions into a persistent omnichannel conversation. Smooch integrates with more communication channels than any other software. Instantly access any messaging channel, from popular chat apps and voice assistants to email, SMS and RCS with a single API. Bring a modern messaging experience to web and mobile users with live chat SDKs you can white label as your own. By integrating with Smooch, your software inherits a treasure trove of conversational data and a powerful messaging toolkit. 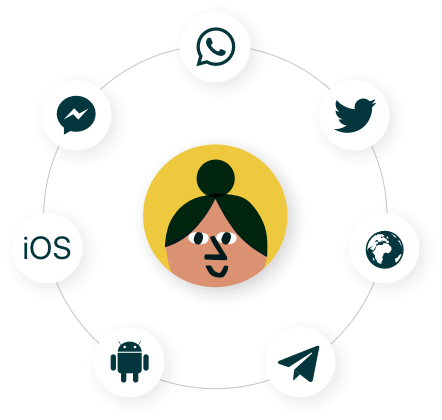 Enable human agents and bots to send rich message types like buttons and carousels to any channel from your software. Capture and maintain context across channels so businesses can authenticate users and personalize conversations. Allow businesses and users to move conversations to another channel without wasting time by having to start over. Coordinate interactions between humans, bots and other software without building any third-party integrations. The worldâ€™s largest enterprise companies depend on us to keep conversations flowing and data safe and secure. Robust uptime SLAs, active 24x7 monitoring and a redundant messaging infrastructure built for resiliency and high-availability ensure your messaging strategy can scale with Smooch. With encryption in motion and at rest and active in-depth monitoring, Smooch is hosted on AWS cloud and inherits the control environment Amazon maintains and demonstrates via SSAE-16 SOC 1, 2 & 3, ISO 27001, FedRAMP/FISMA reports and certifications. Our Privacy Shield certification is supported by role based access controls to production systems as well as annual privacy training company-wide to safeguard your data. Enterprise customers can also choose to host their data on our EU or US infrastructure. The Smooch platform is GDPR compliant. Our omnichannel conversation platform is architectured to make it simpler for you to comply with the GDPR and it includes features that will help you respect your controller obligations. Weâ€™d love to talk about your messaging strategy and help make your software more conversational.